Vault of Light: 20 Days of Gold Making - Day One. 20 Days of Gold Making - Day One. This post will also be part of the February Gold Blogging Carnival over at Cold's Gold Factory. "When did you start gold making & what triggered it?" My journey into gold making didn't kick off until later in Wrath of the Lich King despite having played since Vanilla WoW. In my first few months of WoW I didn't even know there was such a thing as an Auction House. When killing mobs I'd loot the coins and leave the rest of the items on the corpses. A friend had told me cloth was used in tailoring and I wasn't a tailor so I saw no use for it, the same went for leather or cloth BoE greens. I played a Warrior, I wore mail I didn't need any of this useless trash! Little did I know then that once I got to level forty I wouldn't be able afford my first mount which at the time was a whopping 100g. Thankfully I did have a friend who played the game and he took me to Western Plaguelands to farm Runecloth and BoE items to sell on my newly discovered Auction House and I was finally able to buy my mount and training around level forty five / forty eight. I continued to use this method of making gold for the rest of Vanilla as some nights I could barely afford to repair after raiding. Farming on a Protection Warrior was tedious and sometimes difficult so I stuck to lower level mobs. Throughout The Burning Crusade I managed to maintain a steady flow of gold from running my daily heroics and posting any additional cloth and crafting materials on the Auction House. By the middle of BC I had five level seventies all with maxed out professions. I sold everything I picked up on the Auction House but I never spent any of my gold. Having all of my professions maxed meant that I could farm the mats for whatever I needed to craft for my own use. It never dawned on me that other people would also need gems, armour patches or food buffs. During Wrath of the Lich King Blizzard introduced a Feat of Strength called Insane in the Membrane. I knew I wanted it but I had no idea how I was going to get it. I'd already read a post on the WoW_Ladies community on Livejournal about someone who had farmed all of the herbs needed to complete the Darkmoon Faire exalted section of the achievement. At the time there was no Darkmoon Faire with daily quests to hand in for reputation You had to hand in Darkmoon Decks in exchange for BoE trinkets. You could collect the cards from instances, rare mobs or create them with Inscription. I attempted to follow in her footsteps and farm herbs in Zangarmash in order to create cards but I very quickly realized that wasn't going to work for me. I hated farming and I decided I had to find another way. I had around seven thousand gold and six level eighties. It was at this point that I started using the Auction house daily and getting creative with ways to not only save gold but make gold. I scrapped the idea of making Burning Crusade cards deciding to focus on Wrath of the Lich King cards. Many of the trinkets still sold for 3,000-5,000g meaning I would be able to recoup some of my gold back if I bought the herbs to craft the cards I'd also check the AH every day for cheap cards. I installed Auctioneer which provided me with %'s and market values on the right hand side of the AH interface allowing me to gauge when was a good time to buy and when was a good time to sell. Previous to the addons I was completely oblivious to the idea of market value. I just expected items to be the same price every day. I'd never really given the WoW economy much though. Since I could only hand in my Darkmoon decks once every month there came weeks where I'd have little to no gold after buying stacks upon stacks of Icethorn to mill. In order to continue buying materials I had to find a way to make gold while waiting for the faire to come to town to sell my trinkets. Once I began to think about it, it became really obvious to me that the things I need other people also need. Everyone needs gems, enchants, flasks, bags etc. I started buying up Netherweave Cloth for 3g per stack and selling the bags for 12g. I'd check the Auction House for cheap gems during the day to cut and sell after raid time. I slowly started making more gold than I was hemorrhaging out on herbs and even after I had completed my feat of strength I continued making gold. It was in my blood now, part of my routine and something I continue to do today. 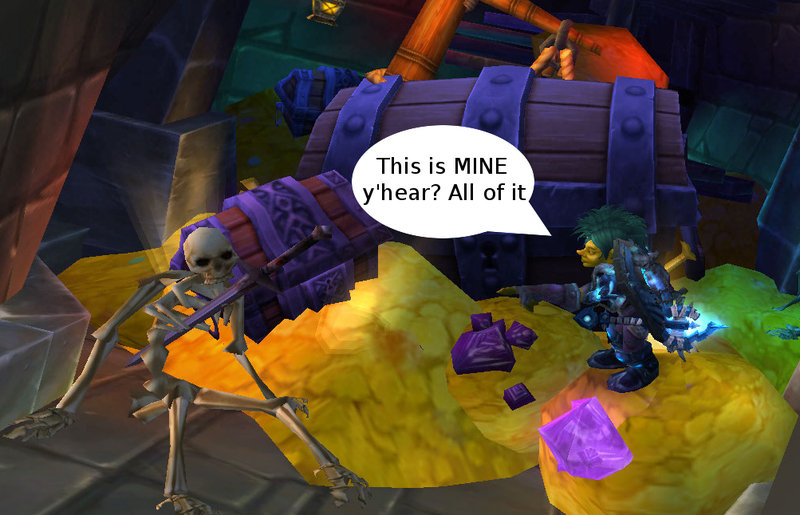 If you take nothing else away from this blog post at least take this; Loot EVERYTHING! If making gold in World of Warcraft is something you're interested in, check out the World of Warcraft gold blog directory from Power Word Gold for a list of gold blogs filled with tips and tricks to help get you started on your own WoW gold journey!